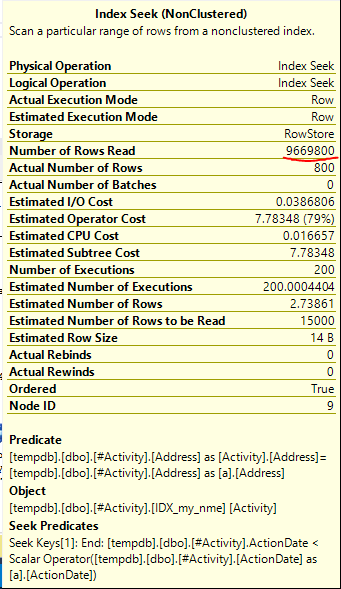 When using a subquery to find the total count of all prior records with a matching field, the performance is terrible on a table with as little as 50k records. Without the subquery, the query executes in a few milliseconds. With the subquery, the execution time is upwards of a minute. Include only those records within a given date range. Include a count of all prior records, not including the current record, regardless of date range. What strategies could be used to improve the performance of this query? In reply to the question of what I can modify on the DB: I can modify the indexes, just not the table structure. I have now added a basic index on the Address column, but that didn't seem to improve much. I am currently finding much better performance with creating a temp table and inserting the values without the PriorCount and then updating each row with their specific counts. The Index Spool Joe Obbish (accepted answer) found was the issue. Once I added in a new nonclustered index [xyz] on [Activity] (Address) include (ActionDate), the query times went down from upwards of a minute to less than a second without using a temp table (see edit 2). With the index definition that you have for IDX_my_nme, SQL Server will be able to seek using the ActionDate column but not with the Address column. The index contains all of the columns needed to cover the subquery but it likely isn't very selective for that subquery. Suppose that almost all of the data in the table has an ActionDate value of earlier than '2017-05-30'. A seek of ActionDate < '2017-05-30' will return almost all of the rows from the index, which are further filtered down after the row is fetched from the index. If your query returns 200 rows then you would probably doing almost 200 full index scans on IDX_my_nme, which means you will read around 50000 * 200 = 10 million rows from the index. It's likely that seeking on Address will be far more selective for your subquery, although you haven't given us full statistical information about the query so that's an assumption on my part. However, suppose that you create an index on just Address and your table has 10k unique values for Address. With the new index, SQL Server will only need to seek 5 rows from the index for each execution of the subquery, so you'll read around 200 * 5 = 1000 rows from the index. I get an index spool. What that means at a basic level is that the query optimizer build a temporary index on-the-fly because none of the existing indexes against the table were suitable. 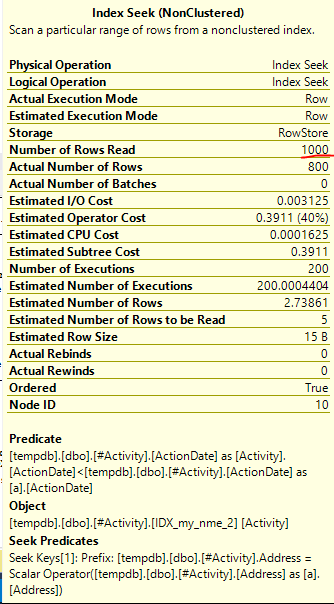 However, with the new index SQL Server only reads 1000 rows from the index. 800 of the rows are returned to be counted. The index could be defined to be more selective but this could be good enough depending on your data distribution. If none of this helps then you'll need to add more information to the question, preferably including actual execution plans. Not the answer you're looking for? Browse other questions tagged query-performance subquery azure-sql-database or ask your own question. How to optimize an ordered date range query with several OR filters (for streaming)? Why TRUNC() date field range constraint is faster? What is the correct method to pass range of dates to a SQL Server 2016 temporal table query where you need a set returned for each day?